Most people have heard of the famous northern Thai dish "Khao Soi", but what about Hunglay? One reason this is so unique is the number of ingredients used to make it. We've been offering hunglay powder for a few years but still, that requires a lot of work to complete the recipe. This hunglay paste is made in Thailand of all natural, high quality ingredients. 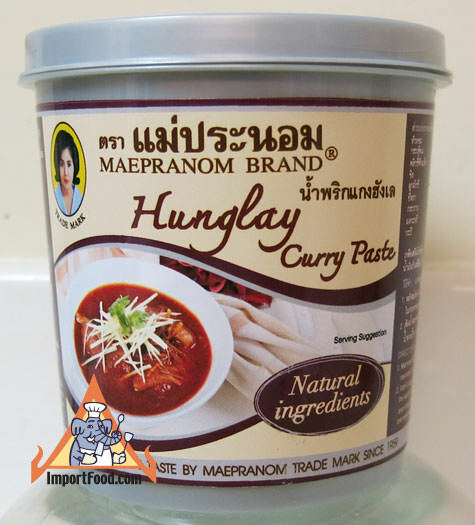 "Marinate 500g chicken or any kind of meat with 100g hunglay curry paste. Marinate for 10-15 minutes. Stir-fry in a saucepan over medium heat until cooked. Add 4 cups of water and simmer over low heat until chicken is tender and the texture of the sauce has thickened. Season with 6 tbsp tamarind paste, 4 1/2 tbsp palm sugar, and 4 tbsp thin soy sauce, stir well then add 1/2 cup sliced ginger. Remove from heat and serve with steamed jasmine rice or sticky rice." Ingredients: onion, garlic, dried chilli, ginger, coriander seed, fennel, cardamom, turmeric powder, shrimp paste (shrimp salt), soybean oil. No preservatives. No artificial colors. No msg.